OwlCappella is Temple University's first co-ed a cappella group, founded in the Fall of 2010. The group performs a diverse assortment of musical styles, from pop to jazz. In the nine years since its creation, the group has made significant strides, including a performance at the White House for the 2016 holiday season, opening the red carpet at the Philadelphia Auto Show’s Annual Black-tie Event multiple times, and opening the 85th Radio City Christmas Spectacular at Radio City Music Hall. Over the years, OwlCappella has recorded several EP’s, which you can find on Spotify and iTunes. 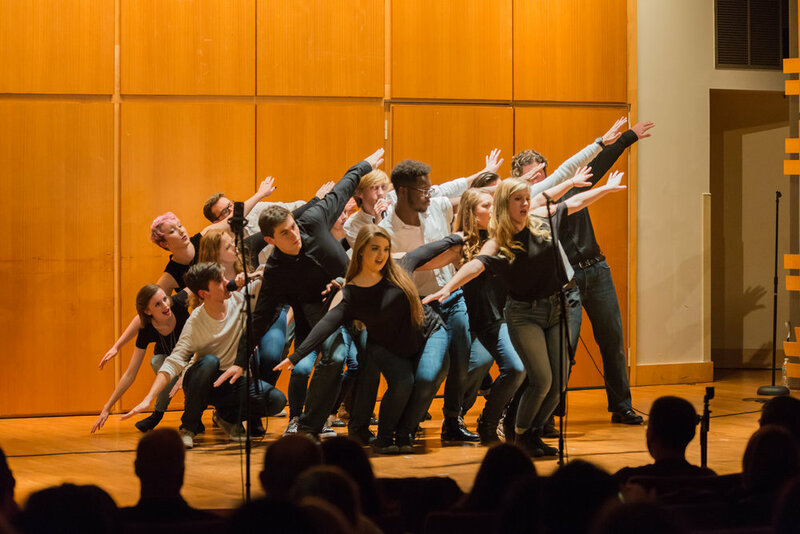 In the Spring of 2018, OwlCappella competed in its first ever ICCA competition. After placing second in the Quarterfinals at Drexel University, OwlCappella won first place in the Semifinals at the Kimmel Center, making them the 2018 ICCA Mid-Atlantic Champions and 2018 ICCA finalists. They won several special awards for their arrangements, choreography, and vocal percussion. OwlCappella also enjoys performing at local venues such as the Franklin Institute and the Philadelphia Art Museum. Every year, OwlCappella hosts their own Spooktacular concert (legendary for having the best costumes in Philly), which features performances from OwlCappella and various a cappella groups from around the Tri-State area. When not performing or rehearsing, OwlCappella’s members love having jam sessions, game nights, and spending time with each other outside of rehearsal. If you want to keep tabs on what Owlcappella is doing next, you can find them on facebook, instagram, twitter, and youtube at OwlCappella.